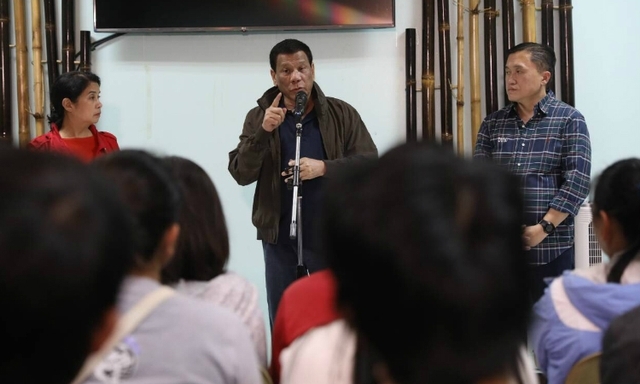 Metro Manila (CNN Philippines, September 17) — President Rodrigo Duterte met with families of the victims of the landslide in Itogon, Benguet. Special Assistant to the President Bong Go shared photos of the meeting which happened Monday. Go said families received P45,000 each – P25,000 in cash and P25,000 worth of goods and funeral and burial assistance. At least 35 people died in a landslide in Itogon Saturday during the height of Typhoon Ompong. President Rodrigo Duterte also attended a press briefing in Benguet where he highlighted the dangers of mining once again. Duterte said, "Mining has been operating in this country uncontrolled." He went on to say the mining industry had a lot of problems, even if the country does earn P70 billion a year from it. "If you're ready to accept that as a good, as a profit, let us make it simple for the country, but in the end, how much do you lose in the process?" Duterte said. "That mining thing has contributed a lot of heartaches for Filipinos. It is time for us, particularly the DENR (Department of Environment and Natural Resources), General Cimatu, to take a second look at the dangers of open-pit mining," he said. The President also called out "rich" miners who violate the law, but have yet to be made accountable for their actions. Duterte also relayed his experience while he was still chairperson of the Southern Mindanao regional peace and order council. If it were up to him, he said, he would close all mining operations in the country, never mind the financial benefits. "We have to give Mother Earth a respite from the endless digging," he said.